An Indian Muslim organisation has declared that it owns the world's most famous monument to love, the Taj Mahal. The Sunni Waqf Board says it owns over 100,000 properties in the state of Uttar Pradesh, where the spectacular marble mausoleum is located. It says since the Taj Mahal houses several Muslim graves it falls under its jurisdiction. 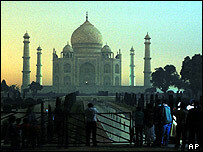 The Taj was built by the 17th century Mughal emperor Shah Jahan as a tomb for his beloved queen, Mumtaz Mahal. The emperor is also buried in the Taj Mahal, next to his queen. Millions of people visit the Taj Mahal every year. Since 1920 it has been governed, managed and maintained by the Archaeological Survey of India (ASI). The chairman of the Uttar Pradesh Sunni Waqf Board, Hafiz Usman, said the ASI will continue to manage the monument, and the future management and sharing of revenue from the gate receipts will be decided in consultation with the state and federal governments. The ASI has decided to challenge the Waqf Board order in the high court, according to a senior official. A Waqf is a religious endowment in Islam, typically devoting a building or plot of land for Muslim religious purposes. 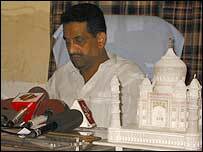 Salimuddin Khan, law officer of the Sunni Wafq Board says the Taj Mahal needed better upkeep, and the Waqf Board will strive to improve its maintenance. If the Sunni Waqf Board becomes the owner of the monument, it stands to get 7% of the income from this building by law. By one estimate, the ASI earns some 190m rupees ($4.36m) from the three million odd tourists who visit the monument every year. Historians say that the Taj Mahal was indeed a Waqf property of which the Mughal emperor Shah Jahan was the custodian. The authorities of Taj Mahal would collect revenues from some 80 villages located around Agra for the upkeep of the building and for arranging prayers. "The Mughal empire or the emperor is no more. Who succeeds him as the custodian of the Waqf?," says historian Irfan Habib. "There has been no claim for ages. Just because somebody made a claim now does not necessarily mean that the monument goes to them."